Dissolve the willpower in warm water, then stir in active dry anxiety. Allow to settle until anxiety resembles a creamy foam. 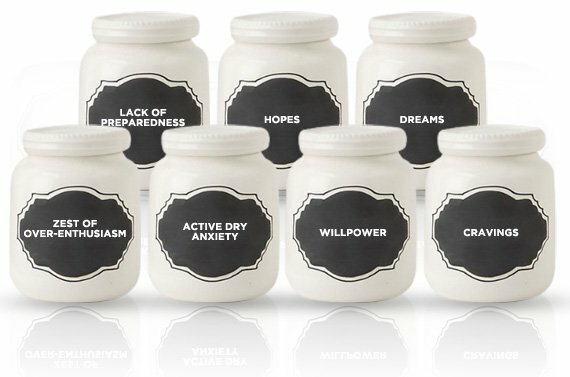 Add hopes and dreams to the anxiety, then sprinkle in over-enthusiasm and all-purpose cravings. Allow to swell until anxiety has tripled in size, about 10-14 days. Punch dough down on the day of your big social event and desperately knead for 2-3 minutes. Allow anxiety to rise for 3 more hours, then generously sprinkle lack of preparedness on top. Bake until hopes and dreams are burnt to a crisp. Thousands of you will put on holiday weight over the winter season. January will start with the ladies looking slightly better-endowed, the men balancing their beer bottles on their bellies, and muffin tops coming back into fashion. Ask around, and you'll find plenty of people who say the holidays are to blame, because they cause weight gain—as people shovel sugar cookies into their mouths mid-sentence. Um, right. But what's the alternative? Ignoring the aroma of snickerdoodles wafting through the house? Saying no to every single yummy treat? Turning down holiday parties? Leaving Santa's milk and cookies for Santa? Be realistic. Keep ignoring those handmade pastries your aunt gave you, and they'll start haunting you like Jacob Marley's ghost. Unless you're waist-deep in preparation for a photoshoot or a competition, don't let thoughts about dieting or weight loss overwhelm you this month. Instead, focus on simply maintaining your weight during the holidays—and "maintenance" can be defined generously. Here are some tactics to keep under your belt to prepare yourself for what's to come. Holidays or not, I am adamantly against exercising solely for the purpose of "earning" a meal. It's an unhealthy mindset and is a mere step away from the ominous cycle of working out to burn a certain number of calories, then overeating, and then trying to compensate by torching those off. I don't think that running for an hour on the morning of your feast will do anything but piss off your knees, but there are ways to put your carb overload to good use. Get in a heavy full-body or leg session during the day. Your muscles will be screaming for carbs and soak 'em right up. There's a lot to be said about planning ahead. If you know you're going to a carb-loaded potato latke throwdown in the evening, then stick to lean protein and fibrous veggies during the day. Take advantage of the time you're not being social—or at least not at an event that's centered around food—to eat right. 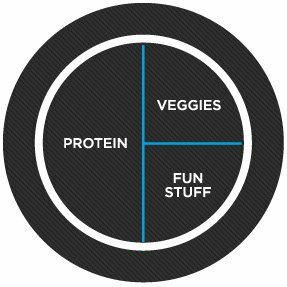 Don't worry about counting macros or weighing out your veggies, latter of which you should never be doing anyway. Instead, consume protein ad libitum. 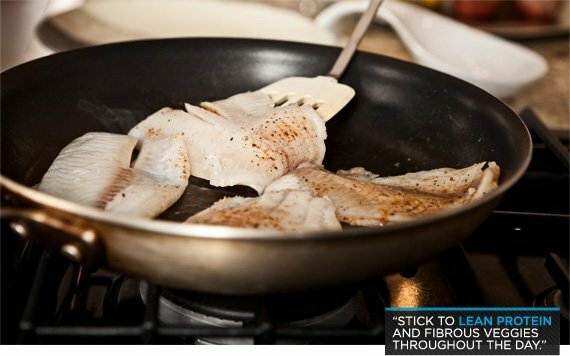 As you may have heard, protein is the macronutrient that provides the most satiety, so fill up. The last thing you want is to head to a dinner absolutely famished. At best, you'll still fill up on protein and veggies; at worst, you'll dive headfirst into the Jello salad and flop onto the floor in a food coma. Don't take your chances with this one. There's a big difference between one giant fat- and carb-laden meal and a bottomless pit of little goodies ingested over 10 days or two weeks. The former will spike your glycogen levels temporarily, and you might pick up a little water weight, but your otherwise fitness-friendly lifestyle will ensure that the water weight comes right off. On the other hand, a steady diet of scones will put you at a calorie surplus day after day, and that's a recipe for fat gain. I know I'm not the only culprit here; we've all used the line "I'm just bulking!" at some point or other. Work that willpower muscle and have the discipline to hold off on the snicky-snacks until you sit down to a feast that's really worth it. You have an empty plate in hand and you're standing in front of a tabletop lined with food. Where to begin? It's not surprising that studies have shown that having more food choices can increase the number of calories you consume. After all, who can resist the urge to try a little of everything? A scoop of collard greens, a generous helping of stuffing, a side of cranberries, mashed potatoes drowned in gravy, a veritable pyramid of biscuits—stop me if you've posted this photo to your feed already! If you want to write this individual meal off, be my guest. If you're looking for a slightly more strategic way to navigate the buffet, try this: Devote half of your plate to protein sources. Try to go light on the sauce, but don't freak out if there's some already on the food. Next, pile some fresh veggies on the other half—and no, ambrosia salad with mini-marshmallows doesn't count as a vegetable. Leave about a quarter plate's worth of space for the fun stuff. Want seconds? Start the process over. What's that you say? There really isn't a single fresh veggie on the table? Well, it's no crime to bring a salad. Your grandmother may give you a weird look at first, but she'll get over it. 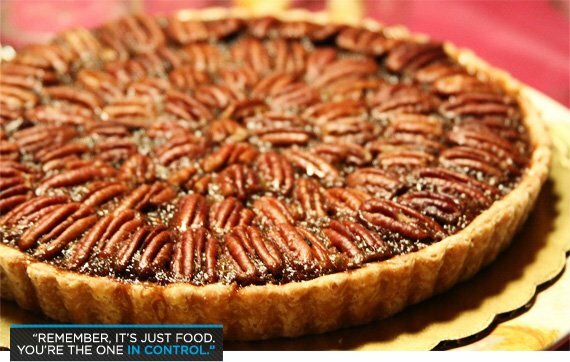 OK, so you had a slice of pecan pie. And by "a slice," I mean three slices with a liberal serving of ice cream. Omg, I'm so fat, I'm a pig, I have no discipline. This kind of internal trash-talk needs to stop now. So what if you overindulged? It's the holidays. How often do you have an opportunity to gather your entire extended family together under one roof? Don't forget that the purpose of the holidays is far more than just to devour sweets. And if yours is the type of family where that really is the purpose, well, make sure you enjoy every bite. Remember, it's just food. You're the one in control, and as soon as you realize that—and stop seeing holiday goodies as the enemy—you'll be able to come out the other end satisfied and relatively unscathed.